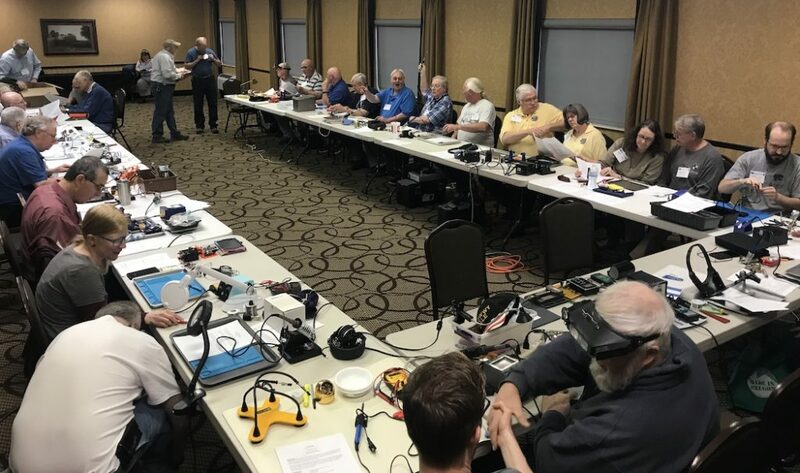 Saturday’s proceedings were a great blend of everything we love about this hobby: history, electronics, designing and building, learning about new technologies while embracing and maintaining our foundations. If you aren’t familiar with OzarkCon, you should take a look at the overview of the event, and look over the detailed agenda to see what took place this year. And then put some markings on your calendar for next year, and join us! What is the sound of fifty Crickets chirping? Tune in to 7.028 and listen! The kit we all put together was the brand-new 40 meter edition of Dave Cripe NM0S’ Cricket. The Cricket is a rather minimalist design, but has some nifty features: no toroids to wind, as there are coils etched directly onto the circuit board; power comes via a 9V battery which clips right to the board; there’s a straight key build right onto the board, and there’s also an optional 1/8” keying adapter; pluggable crystal socket gives old-school frequency agility. You can see more about the Cricket 40 on the 4SQRP site — until info on the 40 is posted, just look at the info about the Cricket 30 and squint a little!